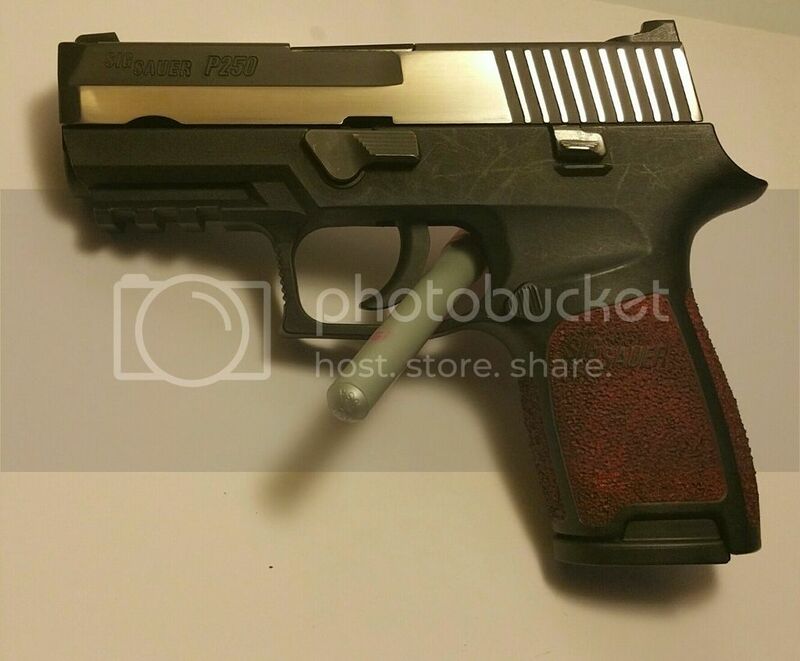 Here's my 250, subcompact slide on compact frame ,bobbed appropriately, I stippled the frame and color filled the grip area, and polished the slide Equinox style. I love the way the gun handles and ccw it regularly. 4 users thanked Privateer for this useful post. 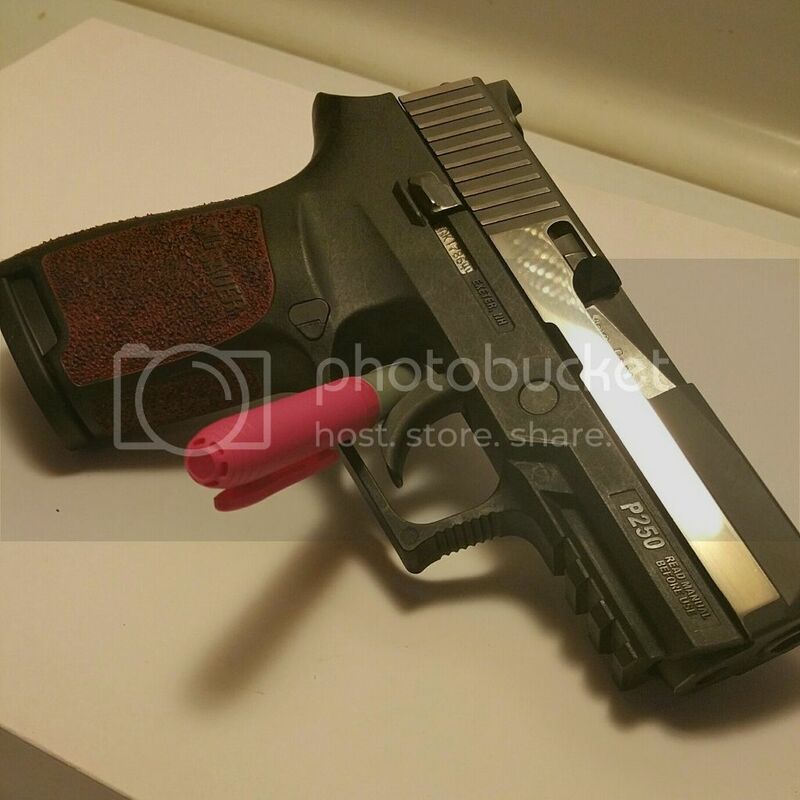 There are quite a few posts, threads & pics of personalized P250s on here. We all like to see what folks are doing to theirs. What did you use to color-fill the grip? I used thinned down enamel paint, the effect is a very subtle in real life and the Sig lettering remained black....not sure why it shows as red in photographs. I am about to get one here shortly. What IWB holster do you use or recommend for it? Having difficulty finding one for the rail model. I have Roger at QVO Tactical make all my holsters, great work, he guarantee's his work and is just a good guy to work with. You'll see in his store, he only mentions the P320 in compact (with rails), but if he doesn't have the bluegun to fit your model, he'll get one. 1 user thanked SCSurfer for this useful post. 1 user thanked Privateer for this useful post. Cool thanks, I checked them both out. Leaning more towards Cooks just cus it has that text box to put in special instructions. Cooks is definitely a great choice, the fit and finish is very impressive....all edges are polished the fit to the weapon was perfect on mine. Good job I like it. What process was involved on polishing the slide, giving it that Eclipse-look? To polish the slide, I completely disassembled the slide first, I lay 320 grit sand paper on a large piece of glass so I have a very flat surface to work on , lay the slide on the sand paper and move back and forth making sure only the flats of the slide or touching the sand paper, onve the nitron is removed , I work down through the various grits of sandpaper until I get the amount of shine I want,...in this case I went to 2000 grit, I have a Glock I worked down to 12000 grit polishing cloth to get a mirror polish.